I am a HUGE fan of Oyster Cakes. I suppose I had them quite a fair bit when I was a young child and eating it revokes memories of my childhood. I recall being able to buy them from this vendor outside my secondary school during my secondary school days. That and ice jelly. The thought of it makes me salivate! However, in the recent years, it's been tough to purchase them and even if I do spot them, they're pretty stale (yucks) or over-fried (even yuckier)! When Meatmen posted their version of it, I was thrilled and couldn't wait to try them! 1. Marinate pork with condiments. Set aside for 20 minutes. 2. Clean prawns and slice into bite sized pieces. I excitedly reserved the head and shells! 3. Cut chives into small pieces. 4. Place all batter ingredients in a bowl. Add the water gradually while whisking the batter. Whisk till a smooth batter is achieved. 5. Set up your station! 6. Heat up oil for deep frying, the deeper the better in my opinion. However, do ensure that you can still hold your ladle well in the depth. 7. Heat up ladle in the oil for 1 minute. 8. Scoop some batter into the ladle. 9. 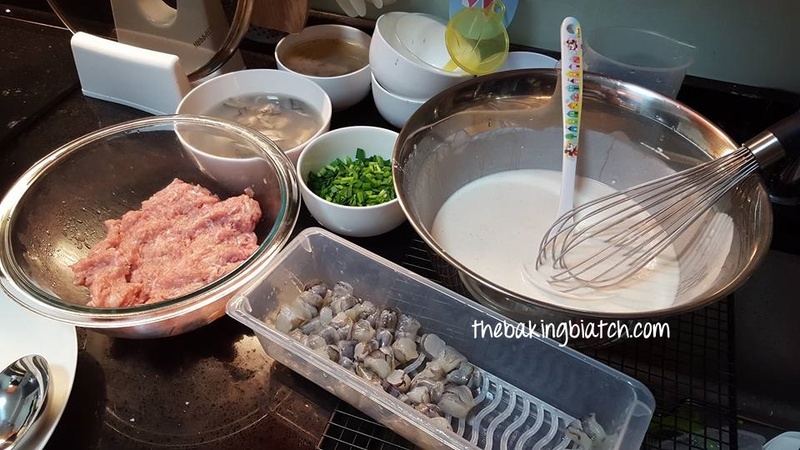 Top with 1 - 2 oysters, 1 - 2 pieces of prawns, some minced pork and sprinkle some chives. 10. Cover/drizzle some batter over the ingredients, ensuring that the chives and ingredients are covered. Top with some peanuts. 11. Gently lower the ladle into the hot oil (on low-medium heat), allowing a 'skin' to form on the upper surface of the oyster cake. 12. 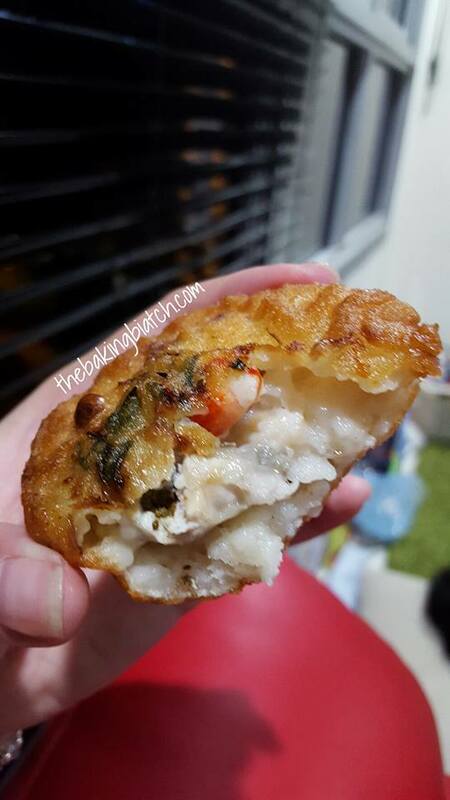 Cook for 2 - 3 minutes or till oyster cake is browned and that the oyster cake can be easily removed from the ladle. 13. Fry for a little while more till the bottom is nice and brown. 14. Remove from oil and drain well. 1) Ladle has to be HOT before the batter is scooped onto the ladle for it not to stick on the batter. Heat it up between each oyster cake for it to be hot enough not to allow for the sticking of batter. 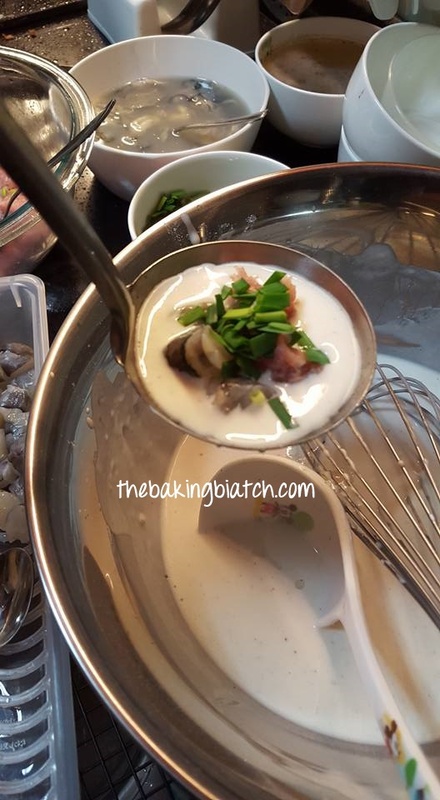 2) Lower the ladle gently into the oil, else straight pokey sticks of batter will form above the oyster cake. 3) A deeper pan/pot allows for less harsh splatter. Enjoy these awesome Oyster Cakes! Hi, my dad would love this! where to buy the ladle and oysters? Also, is it chives or Chinese parsley? Thanks!! Hello Shirley! I got the ladle from Daiso and oysters from Giant (frozen ones).